The daffodils have nearly finished but tulips are starting to replace them. I am really looking forward to the fields of bluebells, having never seen a field of bluebells before. Magnificent! This image truly shows how London, despite the millions of people living there, has "secret" places like in a fairytale. The depth of it seems like endless woods. Daffodils, tulips & Oh! the smell of spring. Wonder where you are going to find a field of bluebells in London? Really beautiful...I really enjoy your blog. beautiful! it's hard to find out a scene like that in Vietnam. Good shot, as usual, Mo. Is the lady confessing her love secrets to the big tree? Or is she waiting for her lover in such a romantic park? Maybe she's only walking her dog and waiting for its return . By the way, where in London did you take this photo? The lone walker adds so much to your image, Mo. Beautiful scene. 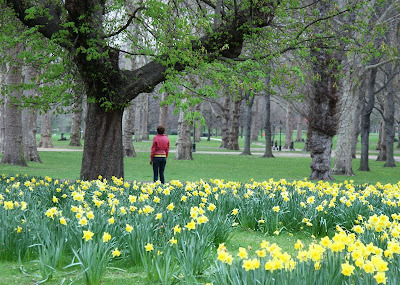 I love London's parks in the early spring. I love the intensity of the different greens. Of course, I love the daffodils too! Spring! have been reading your blog for a while now and i have to say i just love love love it! Like others, I was wondering where in London was this taken? In one of the many, lovely parks? Beautiful!!! Makes me want to climb into the picture and run and play through those woods! Thank you for adding to my day. You've captured springtime beautiful in this photo. Lovely, Mo!! I've never seen a field of bluebells either; can't wait to see your pic of one...! For those who asked, this is St James Park. Right by Buckingham Palace. Yes, its nice how these bulbs stagger their blooming. Don't forget to show us the Bluebells. Daffy-dills are the same the world over, everyone loves them, they're the harbingers of spring. What a lovely place to walk amid the daffodils and trees. I am enjoying your photos of London. I used to live there so its good to see some familiar sights through fresh eyes. BTW you won't find a field of bluebells they generally grow in the woods, sometimes you see them in gardens but never fields. They are a glorious sight, with and beautiful scent.